June | 2014 | Planet Pedro! Posted on 06/21/2014 by planetpedro CommentsNo Comments on Latest on Labour List: Revenge Of The Tories! Latest on Labour List: Revenge Of The Tories! One of the big differences between English and Scottish politics is the Tories; indeed many outside Scotland will see the situation north of border and assume that they are irrelevant: one MP, no influence, no mandate. It is true that they have been marginalised and even anathematised, following their decline under Thatcher and wipe-out under Major. But they are more significant than meets the eye. The Yes Campaign in the Scottish referendum campaign starts from the knowledge that the historic ceiling for support for independence has for decades hovered around 35%, so the project is basically to start from that position of disadvantage and drive the vote up to 50% plus one vote for the day of the referendum. Unlike the devolution in 1997, there is no pretence that such an outcome would represent the settled will of the Scottish people: indeed, in his SNP Conference speech, Alex Salmond set out his plans in terms of how to co-opt the pro-UK parties to accept independence, if his ambition was to be fulfilled. At the same time, the SNP projects itself as a left of centre – and left of Labour – party, although it does nothing that Scottish Labour would not have done, except for tenaciously supporting regressive policies. These include a Council tax freeze (so beloved of Eric Pickles in England), free university education (paid for by cuts to FE places) and free prescriptions (which extend to toothpaste for the rich). This also gives an insight into the type of politics which an independent Scotland might enjoy: hand-outs here, a client group kept happy there. The danger is a drift towards a Fianna Fail – Fine Gael type politics, based on historic bitternesses and perpetuated by the Narcissism of Small Differences. Be that as it may, when challenged and defeated in all other discussion, nationalists fall back on two points, which they think can trump all others: Trident and the Tories. The first can be easily seen off by pointing out the simple facts that unilateral nuclear disarmament can rid the world of some nuclear weapons; multilateral nuclear disarmament can rid the world of more nuclear weapons (and potentially all of them); and Scottish independence will not rid the world of single warhead or delivery mechanism. So as a disarmament policy, it is a fraud. The other argument goes that if Scotland gets independence, “we will never have a Tory government again.” Leaving aside the obvious question posed by the reality that forever is a long time, it is worth looking at this idea, which sounds rather seductive. If only briefly, it has a certain currency, including amongst the tiny but noisy band of Labour members who are intending to vote Yes. In fact, the SNP is a sham social democratic party: its social policies are compromised by its addiction to middle-class perks; and its democratic credentials are undermined by its intended willingness to force through independence without the sustained support of the majority of Scots. Further left, the Scottish Socialist Party is so enfeebled that it no longer stands candidates for elections; its most celebrated leader is now appealing once more against his conviction for perjury, and his successor now charmingly tells referendum voters that Labour’s achievements in power were, in his erudite phrase, “f**k all”. Add the Scottish Greens: a forlorn bunch, tagging along sadly with the SNP, no doubt hating the excesses of the Yes campaign, like the Cybernat monstering of J K Rowling, but all the while lending it a little vicarious credibility. So, in what may come as a surprising contrast, we can also look at the Tories. Their leader, Ruth Davidson, who is having an excellent referendum campaign, and defies stereotypes by being a lesbian kickboxer and former services reservist, (which beats the SSP’s jailbirds and foul-mouthed would-be demagogues). The Scottish Tories also have 15 MSPs, in contrast to absolute zero for the left and 2 Greens, one of whom has never been known to make a public utterance. In 2011, they secured 16.6% of the Holyrood vote as opposed to the Green’s 4.5% and the SSP’s under 0.5%. In 2010, the Tories took 17% of the Westminster vote (although only one MP) while the Greens took under 5%. The far left vote was again not worth recording. In short, the Scottish Tories are a credible and serious political party, while the SNP is a sham – and its hangers-on further left are negligible in terms of popular support. This means that the Tories in Scotland are closer to being in government than any of the left factions would ever admit. Moreover, there is a considerable implication for the referendum in this, in that the Tories represent a solid bedrock of nearly 20% of support for the union, i.e., the No vote. They are well-organised, and look certain to vote. My guess (no more) is that the referendum outcome will be at the upper range of the Yes campaign’s realistic expectation: about 40%, (therefore 60% No and a difference of 20%). If the difference is less than that, the voters will have dealt the Yes campaign and the SNP a deeply ironic blow: defeat by 15% would be entirely due to the frequently maligned and usually marginalised Conservative voters. If the referendum vote is close, look out for the Revenge Of The Tories. Posted on 06/11/2014 by planetpedro Comments1 Comment on Latest letter published in Herald – Dangers of Scotland divided against itself. 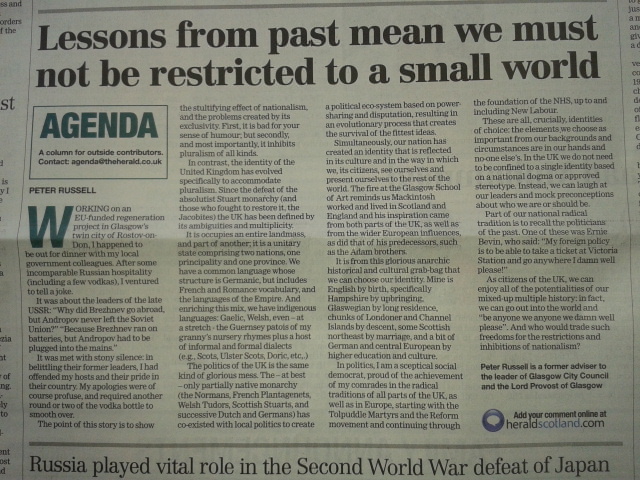 Latest letter published in Herald – Dangers of Scotland divided against itself. MURRAY Pittock’s account of various referendum outcome scenarios is interesting, but omits the most dangerous and damaging possibility, which is in fact the only likely circumstance of a Yes victory (“The only certainty is there will be change following the referen­dum”, Agenda, The Herald, June 10). Decades of opinion polling and election results indicate that independence is rejected by between 65% and 70% of Scots. However, the Yes campaign has it made it clear that it would ignore this background and grasp any simple majority on one anomalous day, no matter how slim, and if necessary secured as a minority of the electorate, as a mandate for independence . In other words, incredible as might seem, the SNP and their allies will celebrate a Scotland totally divided against itself, with a bitter separation from the UK created without the active or demonstrable consent of the majority of its citizens. A vote for Yes would also inevitably set different parts of Scotland against each other. Others have mentioned the question of Orkney and Shetland, and opinion polls show support for remaining in the UK strong in the Borders – it is easy to see how a case could be advanced in that region, if it votes No, for the border itself to be renegotiated. However, there is a very simple way to prevent this nightmare scenario, and fortunately, one which appears to be the choice of most Scots: the opinion polls continue to show that most Scots throughout the country prefer an emphatic No vote. Reproduced with thanks to the Herald. Working on an EU-funded regeneration project in Glasgow’s twin city of Rostov-on-Don, I happened to be out for dinner with my local government colleagues. After some incomparable Russian hospitality (including a few vodkas), I ventured to tell a joke. It was met with stony silence: in belittling their former leaders, I had offended my hosts and their pride in their country. My apologies were of course profuse, and required another round or two of the vodka bottle to smooth over. The point of this story is to show the stultifying effect of nationalism, and the problems created by its exclusivity. First, it is bad for your sense of humour; but secondly, and most importantly, it inhibits pluralism of all kinds. In contrast, the identity of the United Kingdom has evolved specifically to accommodate pluralism. Since the defeat of the absolutist Stuart monarchy (and those who fought to restore it, the Jacobites) the UK has been defined by its ambiguities and multiplicity. The politics of the UK is the same kind of glorious mess. The – at best – only partially native monarchy (the Normans, French Plantagenets, Welsh Tudors, Scottish Stuarts, and successive Dutch and Germans) has co-existed with local politics to create a political eco-system based on power-sharing and disputation, resulting in an evolutionary process that creates the survival of the fittest ideas. Simultaneously, our nation has created an identity that is reflected in its culture and in the way in which we, its citizens, see ourselves and present ourselves to the rest of the world. The fire at the Glasgow School of Art reminds us Mackintosh worked and lived in Scotland and England and his inspiration came from both parts of the UK, as well as from the wider European influences, as did that of his predecessors, such as the Adam brothers. It is from this glorious anarchic historical and cultural grab-bag that we can choose our identity. Mine is English by birth, specifically Hampshire by upbringing, Glaswegian by long residence, chunks of Londoner and Channel Islands by descent, some Scottish northeast by marriage, and a bit of German and central European by higher education and culture. In politics, I am a sceptical social democrat, proud of the achievement of my comrades in the radical traditions of all parts of the UK, as well as in Europe, starting with the Tolpuddle Martyrs and the Reform movement and continuing through the foundation of the NHS, up to and including New Labour. These are all, crucially, identities of choice: the elements we choose as important from our backgrounds and circumstances are in our hands and no-one else’s. In the UK we do not need to be confined to a single identity based on a national dogma or approved stereotype. Instead, we can laugh at our leaders and mock preconceptions about who we are or should be. As citizens of the UK, we can enjoy all of the potentialities of our mixed-up multiple history: in fact, we can go out into the world and ‘be anyone we anyone we damn well please’. And who would trade such freedoms for the restrictions and inhibitions of nationalism?